The PA-LR THREE Speed Low Rider. Is it a Chopper? Is it a Low-Rider? Perhaps it is both! One thing for sure, It's totally cool. 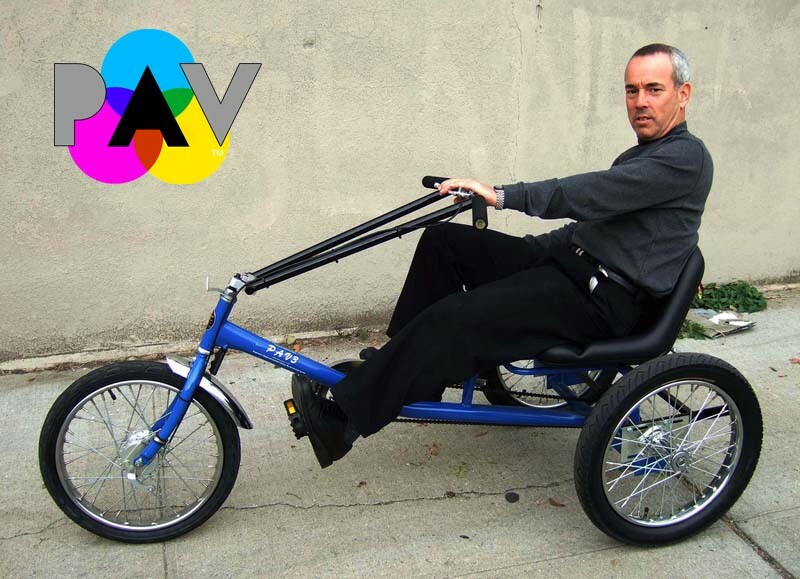 This incredibly sleek looking trike is built just like our Personal Activity Vehicle (PAV3), but with a lower profile, lower seat position, 20" wheels all around and 20x3" Extra Wide Rear "Chopper" tires. This trike is incredible. Aggressive lines, super heavy-duty, incredibly comfortable and hard to imagine fun. Front Drum Brake and Rear Coaster Brake make stopping sure and true. Exclusive Worksman Clincher rims, 11g spokes, 7/8" machined axle make this vehicle truly "Worksman Tough". Note: There is no rear basket on this model. The supportive high back padded seat is fully adjustable so riders from 4'6"-5'9" tall will find this cycle to be a good choice. The weight capacity of 550 pounds, tells you all you need to know about the durable Worksman design. The almost recumbent ergonomics makes this the perfect trike for anyone. Whether for flat-out fun or therapy, The new Worksman PALR-Low Rider sets a new standard. All Pav trikes ship 99% assembled via Truck. Factoids: Weight Capacity 550 Pounds. Height of seat surface from Ground 19.5". Key Seat Dimensions 18.5" wide, back is 13.5" high. Cool Factor: Infinite. Select Frame Color: Gloss Black Electric Blue Racing Red Safety Orange (+$35.00) Safety Yellow(+$35.00) Putting Green (+$35.00) Polar White (+$35.00) Seafoam Teal (+$35.00) LA Lavender (+$35.00) Bubble Pink (+$35.00) Midnight Blue (+$35.00) Grey (+$35.00) Armrests: none 7912AHB Swivel Down Armrest Sets (+$85.00) Tube Liner Insert: none TL3 Tire Liners (+$35.00) Tire Sealant: None TS3 Tire Sealant (+$25.00) Crank Upgrade: None L1265U Precision Sealed Crank Bearing Set (+$50.00) Pedal Upgrade: Standard N16 7217-41038 Weighted pedal with foot straps (+$18.00) P18 Flashing LED Safety Pedals (+$21.00) N18 Oversized platform Alloy pedals upgrade (+$18.00) P18A 7217-30662 Special needs platform pedals with heel support (+$100.00) Pedal Extenders: None 7217-EXT Pedal good for those with wide shoes size (+$29.99) Water Bottle with Mounting Bracket:none 95021 water bottle with mounting bracket (+$29.99) Seatbelt: none Seatbelt (lap type)(+$45.00) Canopy Roof: none 791PAV Canopy Roof Set (+$169.00) Audible Warning Device: none 3973 Megahorn(+$23.99) P2 Ding Dong Bell(+$9.50) P3 Squeeze Bulb Horn(+$11.00) Bar End Mirrors: None 5848 Bar end mirror(+$19.50) 5848 Pair Bar end Mirrors (+$39.00) Special Needs Head Support: None Headrest Support upgrade (+$159.00) Bicycle Helmet: None Bicycle Helmet Adult Size P19(+$24.99) Battery Operated Headlight: None 3976 Battery Operated Headlight (+$19.50) Electric Assist:none ENG-BK-Upgrade Hub Electric Drive Economy System (+$859.00) note- check local rules regarding use of electric assists. Seat height from Ground; 20"
Gearing: Standard; Three Gears, controlled by dual action shift lever on handlebar- steering tiller. Rider Size: Personal Activity Vehicles have adjustable seats that slide back and forth for rider comfort. The Standard Low Riders are for riders from 4.6" to 5'7". Taller Riders should purchase the Stretch version." It is a beautiful trike and I am sure I am going to love using it. Unfortunately 2 days after it was unpacked I had surgery on my back and cannot ride it. Once healed I will be able to more than appreciate its beauty.